Set up size: 26.5" x 10" x 1"
The Household Essentials Laundry Shelf comes in a space-saving design and is easy to assemble. 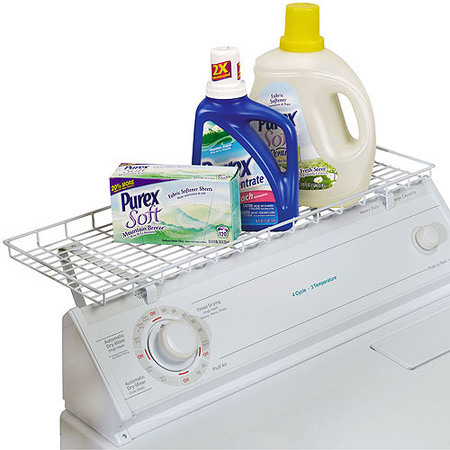 You can mount it over the top of a washer or dryer to you store detergents, soaps and other accessories. With a vinyl-coated finish, it is safe for your appliances. This white laundry shelf is durable, and it accommodates standard laundry bottles. It is ideal for compact spaces such as dorm rooms and apartments. Use it to keep your laundry area neat and organized while keeping your items easily accessible. When set up, it measures 26.5" x 10" x 1" in size. Great shelving - glad I bought two! I saw this online and was a little skeptical about it only because a few people had mentioned that they didn't fit on their particular washers. I bought two of them, anyway, in hopes that they did fit my washer and my dryer. I really wanted them because the wall behind my washer/dryer is concrete and I didn't want to have to drill shelves into it. They arrived in such a timely manner and it was a breeze to pick them up from the store (I did site-to-store for the free shipping). We put them on the washer and dryer both in just few minutes and I was so pleased! They hold all of my laundry items wonderfully and I would recommend them to anyone. Works like it should and a great deal. This product works the best over an appliance that has a flat top. My dryer has the flat top meaning the shelf can support more weight. Washing machine has the wedge so the top hooks don't have anything to grab on to so i cant put much weight on that shelf. Also walmart has the best price. Some people have complained that instructions are hard to figure out. All i can say to those people; do you need a reminder to breath? Instructions and hardware come with the shelf. There are only 4 bolts, 4 nuts, 4 washers, 4 holes on the bracket and 4 holes on the shelf. It's self explanatory. Easy to put together. Allowed me to store small items in a quick accessible place. I put a box of dryer sheets and gloves and used the other half of the shelf for my dogs treat bags. Handy shelf for sure! Going to put another on my washer too. ....as we don't have a laundry room , and need a place for detergent , fabric softener , etc., this shelf helps a lot. It is easy to put together , and after a couple of tries at bending the legs to the right angle for my machine , it now is level. I didn't give it 5 stars as it is a bit flimsy..... but then if it were sturdier I probably couldn't have bent the legs back as easily. The metal '' feet '' have plastic covers , so the machine won't get scratched . If we move , I can take it with us , as opposed to fastening a shelf to the wall. A few weeks ago order some rollers drawers to go between my washer & dryer and they hold quite a bit but the bottles have too be a certain size. So I order 2 of these shelves one to fit on my washer & one for my dryer I order them so I can put any size jugs on them. I usually get family size liquid detergent. One fits my dryer great my boyfriend did have too bend them down a little the directions tell you that you might have too. The top of my dryer is straight but my washer top is rounded the shelf don't fit it as good we had too fix the washer where the shelf will lean up against the wall so we could use it without falling off but evently that will rub my wall. So they are great if the top of your washer & dryer is straight across at the top if they are rounded you need too find something else. Before I ordered these shelves I read the reviews some people complained about the bottles falling off my bottles havene't fell off yet. I was pretty excited about this product, it was pretty much exactly what I needed for more shelving in our small apartment. Unfortunately, when I put it together (fairly simple to do, but no instructions included at all) and tried to fit in on the washer, it would only fit against the washer at a sloping angle. I raised it to a level position and measured it. There was a 3 inch gap. So basically, the product is not exactly what I expected. If you have a Hotpoint washer, this product probably won't fit properly. I did test it to see if it was sturdy enough to hold my large container of All and it holds up pretty well, just looks kind of funny at that angle. I had high expectations for this shelf. It is totally serviceable, but it does lack some stability. As with most "universal fit" products, it can be made to work. My major problem with this product was the shelf supports are not heavy enough to be stable. You can bend the brackets to level the shelf but when you add any weight to the shelf the brackets slide down the back of the washer. I applied some stick-on Velcro to the bottom of the brackets and solved my problem. If you are a little bit creative, you can expect great storage space from this shelf. If not... you may want to look for something else. This was such a great idea...but I didn't think of the curve on the top of the washer or dried! It won't set level so I have to be extra careful when I take things on and off of it. Also, it wasn't made to hold the larger sizes of product. It moves around as you take things off it. It would probably be OK if my drier didn't have that slight curve to it. The front arms need to be a bit longer. Also, the back arms need to be bent to work for the machine which can cause that to lean back some which is why the front arms need to be longer. I wish there was a better way to secure it to the machine. I'm going to have to figure out a way to make it stay firmly on the machine. I think even if I didn't have that slight curve the would be a huge problem. Additional organization but only with support. The shelf does not clamp onto the washer or dryer as pictured. It balances there but you have to affix it to a wall for additional support or it doesn't work at all. Be prepared to buy fasteners for your wall. When the Shelf is in place and you want to pick the soap to put in the washer - I open the washer lid then you can't obtain the soap because the lid is open and the shelf is too low. The Shelf needs to be 8 inches higher and attached to the wall to be useful.